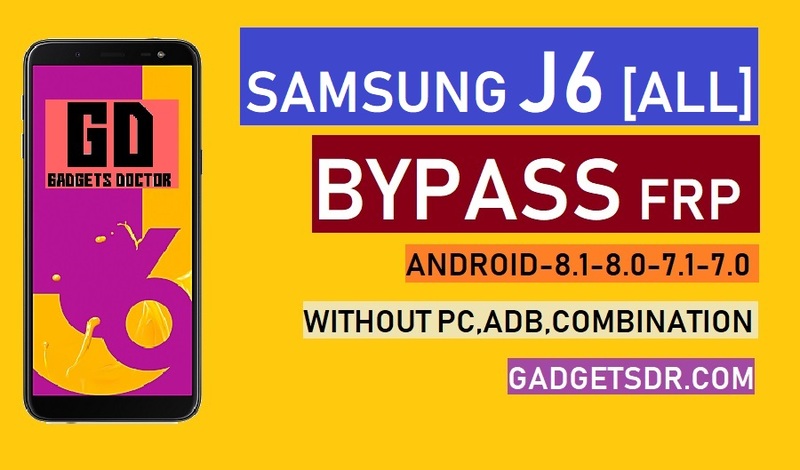 Today we share with you a new process that helps to fix your Samsung Galaxy J6 Bypass FRP without PC Bypass Google Account problem on Android-8.1. with this process, you can easily add a new Gmail ID on your phone, without using any firmware or combination files even without using PC you can do that, Just follow the below method step by step very carefully to successfully fix your Samsung Galaxy J6 Bypass FRP Google Account. Only you have any other android phone and two valid sim cards and an apk file to successfully Bypass Google Account Samsung Galaxy J6. Note:- We try this method on Samsung SM-J600F, you can also try this method on any other device of Samsung J6. -First of all, turn on your device. -Then tap on the next icon. -Now connect your device to any valid wifi network. -Done, now you need to insert a valid sim card. -Once you inserted a sim card on your device, then on your other Android device download an apk file. -Download the apk from here, once you have downloaded the apk file on your other android phone. -Then install the apk file from there. when the installation is done, tap on the open button. -Once open, now click on the “Wap push SL” on that apk file. -Now first enter the “Phone number” and then select “Use no URL prefix”. Note:- Make sure you have entered the locked device “phone number”. (That you inserted before). -After that, type this following link there “www.youtube.com/gadgetsdoctor” and then hit the send button. -Now, wait to deliver the message on your locked device to Bypass Google Account Samsung Galaxy J6 Without PC. -Once the message is delivered, then check on your locked device, you will get a popup message on your device screen. -Just tap on the “OK” button from that popup. -Boom, now you have successfully entered on your “youtube” applications. -Once you access the Youtube application, that’s mean now you can easily Samsung Galaxy J6 Bypass FRP Without PC in your device. -Now on the “youtube” application, drag down the video by swiping your fingers up to down. -Then tap on the “User” icon from the top right corner. -Boom then you will access “Google Chrome” browser. -Just tap on the “Accept & Continue” then tap no thanks. -Now at the top, you will get the “search bar”, just tap on the “search bar” and type there- Bypass frp Gadgetsdr and then tap on the search button. -Waiting for the result, once you get the results just tap on the “Gadgets Doctor Bypass|Gadgets Doctor” at the top of your search results and URL should be coming from “gadetsdr.com”. -Then open that page, download two applications from there to successfully fix Samsung Galaxy J6 Bypass FRP Without PC. Google Account Manager (6) apk. -Once you downloaded the apk at the bottom of your device screen you will get the “open” popup, just tap on that “Open” from that popup. -Then you will get another popup menu, just click on settings, and enable the “Allow from this source” there and then tap on the back button. -Now install “Google Account Manager” from there by tap next -next – done. -Now download the FRP application to Bypass Google Account Samsung Galaxy J6 easily. -Then go back to “Gadgetsdr.com/bypass” page once again. -There download the “FRP Bypass (GD).apk” applications from there. -Once downloaded you will get the “Open” button once again, just tap on that and install the apk. -Once you have installed the apk then tap on the “Open” button to open the applications. -Just tap on the “3” dots from the top right corner, then tap on the “Browser” sign in screen. -Done, just sign in there with your any valid Gmail ID to successfully fix Samsung Galaxy J6 FRP Bypass problem. -Once done, then reboot your device. Thanks for visiting us, Comment below if you face any problem With Samsung Galaxy J6 FRP Bypass | Bypass Google Account Samsung Galaxy J6 – Android-8.1, we will try to solve your problem as soon as possible. you can check other some tutorial here to help you.